C'mon, a $250 buy-in with $200 bounties on every player? Sign me up. That's tonight's 6pm tournament - Event 2 in the $100k Series - dubbed a Winner Take All for once the bounties are paid out, the remaining prize pool all goes to the tournament winner. Start with 12,000 stacks, play 20-minute levels for 12 levels, move to 30-minute levels the rest of the tournament. 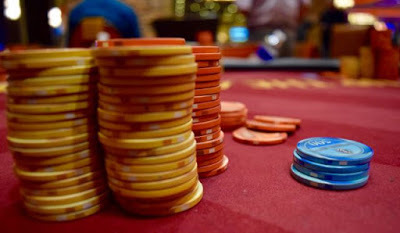 This one is unlimited entries, because once you earn a $200 bounty, well, a re-entry is only an extra $50 on top of the bounty, so go for it, run a stack up and start collecting bounties.